Saturn’s moon Enceladus is a cosmic wonder: a brilliant white snowball with a subterranean ocean and ice volcanoes, nestled in a gas giant’s rings. And based on samples collected during today’s historic flyby, we might soon know if this unexpectedly Earth-like moon is habitable. In just a few hours, NASA’s Cassini probe is going to nose-dive through the plume of water ice spewing out of fissures at Enceladus’ south pole. It’ll be collecting samples and decoding their chemistry to assess the habitability of the moon’s subsurface ocean. What Cassini finds during this flyby could well determine whether NASA sends a dedicated life-seeking mission to Enceladus in the future. In anticipation of all the awesome science to come, let’s review what we know about this fascinating Saturnian satellite, and what we can expect to find out. If you were cruising past Saturn on an interplanetary sabbatical, you might get lucky enough to spy a gleaming white pearl, nestled in the gas giant’s dusty E-ring 150,000 miles out from the planet itself. Whip out your space-grade binoculars for a closer look. If the object is perfectly round, 310 miles across, and enveloped in a halo of icy grains, then congratulations, my friend, you’ve found Enceladus. Covered in a thick ice sheet that reflects nearly 100% of incoming sunlight, the tiny Saturnian moon of Enceladus is one of the brightest objects in our solar system. Enceladus first caught the eye of astronomer William Herschel in 1789, but little was known about the moon until Voyagers 1 and 2 sailed past Saturn in the early 1980s. In recent years we’ve gotten to know Enceladus much better thanks to NASA’s Cassini probe, whose high-resolution images of the moon reveal a motley mixture of cratered glaciers, icy fissures and frozen plains. If the gravity were a bit stronger, it’d be a cross country skier’s paradise. Enceladus’ diverse and largely crater-free surface suggests that the moon is geologically active today. That means it may have a hot planetary core, and while any radiogenic heat left over from the moon’s formation should have dissipated long ago, scientists speculate that Enceladus is tidally heated through gravitational interactions with Saturn and the moon Dione. (Tidal forces are also thought to power Jupiter’s eruptive moon, Io, and perhaps Europa). The case for an active interior was strengthened when Cassini flew past Enceladus in 2005 and discovered tremendous plumes of icy material spewing out of the moon’s south pole into space. There are over 100 of these south polar plumes, hurling icy grains through the moon’s thin atmosphere and off into space at approximately 800 miles per hour. 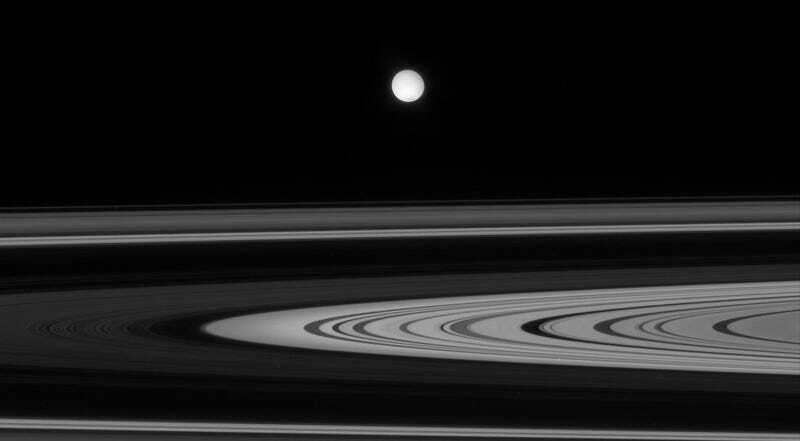 The plumes create a halo of fine mist that supplies Saturn’s E-ring, a wide and diffuse disk of ice and dust. Quite literally, Enceladus is being devoured by Saturn. Early on, the moon’s plumes were likened to jets from a high-pressure hose, but a recent analysis suggests that “curtain eruptions,” similar to Hawaii’s famed volcanic fissures, may be a more accurate description for the material spewing out of miles-long cracks in the moon’s surface. A globe-spanning ocean is exciting enough, but it gets even better: We’ve tasted this moon’s plume water, and it’s surprisingly Earth-like. Samples collected by previous Cassini flybys revealed water vapor, simple organic compounds, salts, and ammonia. Earlier this year, Carnegie Science’s Christopher Glein used this data to construct a chemical model of Enceladus’ ocean. His work suggests that the ocean’s seawater is alkaline, with a pH between 11 and 12. While that’s basic by Earth standards — our oceans have an average pH of 8.1 — it’s not necessarily too basic. There are alkaline lakes on Earth that harbor diverse microbial communities. What’s more, the ocean’s high pH is best explained by serpentinization, a geochemical process that produces molecular hydrogen (H2). H2, in turn, is an energy source that supports microbes living in Earth’s crust today. This metabolic strategy could be as old as life itself, perhaps originating in deep sea vents billions of years ago. That’s why Lunine and colleagues recently proposed the Enceladus Life Finder. The Life Finder mission, which I wrote about last spring, would be a lightweight, solar-powered probe, designed to sail through Enceladus’ south pole plumes, collect samples, and use state-of-the-art mass spectrometers to hunt for amino acids, cell membrane components, and other biosignatures. Analysis of the carbon and hydrogen isotopes present in Enceladus’ seawater could offer further evidence of metabolic reactions. Within weeks of collecting samples, such a mission could tell us whether Enceladus has life. If it were up to me, it’d be the next mission on our list. But there’s a big solar system to explore and limited funds with which to do so. NASA has already committed to a Europa mission in the 2020s. New Horizons is well on its way to the Kuiper Belt and we’d love for it to continue doing great science. The NASA Discovery Program’s latest shortlist of low-cost planetary exploration missions highlighted other intriguing targets, including a crazy metallic asteroid, the Trojan asteroids orbiting Jupiter, and our long-neglected nearest neighbor Venus. Enceladus didn’t made the latest cut, but depending on the data Cassini collects this week, the tiny moon could get another shot. At approximately 11:22 EDT this Wednesday, Cassini will make its deepest dive yet into Enceladus’ south pole plume, sailing 18.6 miles (30 km) over the the moon’s surface. It’ll be moving at a vigorous clip —some 12,000 miles per hour (19,000 kph) — which means the flyby will be over in a fraction of a second. But that’s enough time for Cassini to collect the tiny sample of ocean water needed to answer some of the most pressing questions about this enigmatic moon. Plumes from Enceladus’ geysers are illuminated by Saturnshine. Image Credit: NASA/JPL-Caltech, Space Science Institute. As Linda Spilker, a Cassini project scientist at the Jet Propulsion Laboratory explained in a teleconference on Monday, today’s flyby has three main science goals. First and foremost, using Cassini’s neutral mass spectrometer (INMS) to seek out the molecular hydrogen we suspect is present. “The measurement of H2 is a key component of the energetic basis of habitability on icy worlds,” Glein told Gizmodo in an email, noting that its discovery would “feed into the objectives of next-generation missions, including the Enceladus Life Finder and sample return.” In addition to representing a viable energy source, Spilker notes that molecular hydrogen would “provide an independent line of evidence for hydrothermal activity taking place” at Enceladus’ seafloor. Finally, Wednesday’s flyby will hopefully settle the debate over the nature of the plumes themselves — whether they’re discrete, high pressure jets, or curtain-like eruptions, a distinction which Spilker says will have “major implications for how long Enceladus might have been active.” Although the moon’s south pole will be facing away from the Sun at the time of the flyby, Cassini will also be snapping tons of images using Saturnshine, sunlight scattered off the local gas giant’s atmosphere. We’re expecting a phenomenal view of the plumes, backlit against Saturn and its rings.